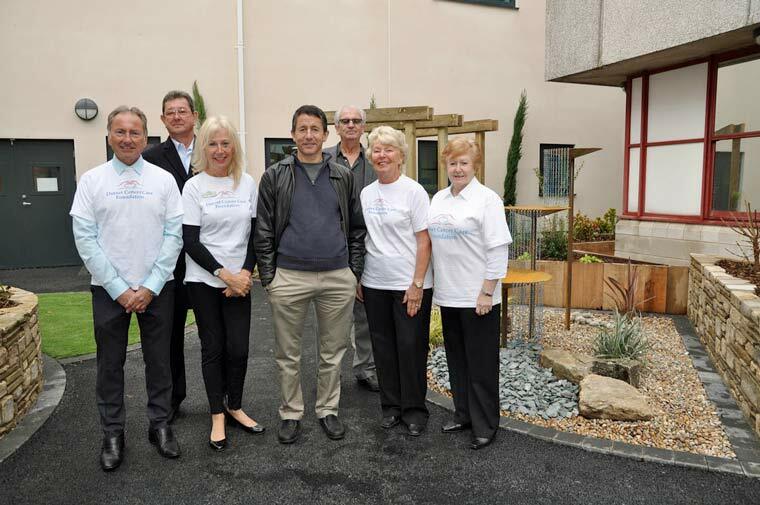 Steve Blonstein and trustees of Dorset Cancer Care Foundation, the charity he tasked with finding projects to benefit from his late aunt’s will – in the new Orchard Garden at the Royal Bournemouth Hospital. A new garden at Royal Bournemouth Hospital has been created with the help of American Steve Blonstein who donated a quarter of a million pounds to Dorset cancer charities. Steve, from California, contacted Dorset Cancer Care Foundation two years ago and made them the shock offer of £250,000 from his late aunt Betty Hyams’ will. Having spent part of his childhood in Dorset, he wanted the money to be spent on good causes here. Dorset Cancer Care Foundation (DCCF) which provides grants for local people affected by cancer, set about finding suitable projects to receive a Betty Hyams legacy. On 23 November Steve visited the Orchard Garden at Royal Bournemouth Hospital, part of which has been named in honour of his aunt. He continued: “It’s fantastic to come back to Dorset and see how my aunt’s money has been used to help people with cancer. Steve Blonstein’s aunt, Betty Hyams died in 2013 at the age of 86, leaving Steve and his sister Anne as the beneficiaries of her will. Ms Hyams stated that should either of her beneficiaries pass away from cancer prior to her, their share should be awarded to a cancer-based charity. As Anne had already passed away from cancer, and because Steve has such fond memories of his childhood in Dorchester and Wimborne, he wanted it to help people in Dorset. Dorset Cancer Care Foundation nominated the Orchard Garden project as a Betty Hyams beneficiary because it gives patients using the Jigsaw Building and renal department a peaceful environment to enjoy before, during and after treatment. A courtyard with seating is linked via a sensory pathway to lakeside areas. The Betty Hyams award has contributed to the cost of providing the lakeside garden. Dr Helen McCarthy, Consultant Haematologist, said: “A patient’s environment can have a really positive impact on their experience at what can be a very frightening and difficult time of their lives and the garden offers patients a sanctuary. Chris Thomas, the Chairman of DCCF, said: “We were honoured that Steve entrusted us to administer the Betty Hyams Awards. A Betty Hyams award has also paid for the Wessex Cancer Trust to create the ‘Betty Bus’, a mobile counselling and information vehicle to support cancer sufferers living in rural west Dorset. And Lewis-Manning Hospice in Poole has also received two Betty Hyams awards, including £18,500 towards a treatment room where day patients can receive medication they need through the night.